A good rain, totaling more than an inch, fell in Prineville the first three days of this week. While the rain was falling in the valleys, snow piled up in the mountains. There was some snow in the valleys, too, but it only stayed on the ground a few hours. The heavy rains during the past few days and constant traffic with heavy trucks and other vehicles to and from the depot has developed a very bad place in the north end of Main Street, where many people have come to grief the past two days. Delivery of coal and wood from the warehouse, and almost all traffic, will be badly hampered until this place is fixed. It will no doubt be given immediate attention by the city authorities. Next Saturday will be Tag Day; tags will be sold by Crook County High school boys and girls. Have your dimes ready; 60 percent of the proceeds will go the local H.S. Loan Fund, and 40 percent to the State Scholarship Loan Fund. The local fund has been of great assistance to a number of students who otherwise could not have remained in school and is worthy of your hearty support. The Prineville-Crook County Chamber of Commerce went on record Monday as favoring action by Crook County and City of Prineville officials to complete an 80-by-100-foot hangar now half finished at the Prineville airport. The action was taken on recommendation of the airport committee of the chamber, headed by A.R. Bowman. Judge Bowman's committee was largely responsible for the first development work on Prineville's new airport, and the chamber of commerce provided the funds with which the first survey of the runways was made two years ago. Plans for a paper salvage collection campaign in Prineville are still being worked out, but it now seems probable that paper will be collected here, according to Ray Moore, chairman of the Crook County salvage committee. This year, while the waste paper collection campaign has been resumed in many areas, salvage committees were asked by federal authorities to be certain of arrangements to sell the paper collected before asking people to turn it in. Mr. Moore has been in contact with waste paper buyers in Portland, and this week he received information that there is a market available. The training program at the Prineville airport was halted suddenly Sunday when the Portland Flying Service received a telegram from John P. Morris, director of the CAA war training service, cancelling its flight training contract. Similar action was taken at all civilian flight schools which had been operating under the CAA. Miss Louise Noblett recently sent a letter to the Prineville Chamber of Commerce to ask the whereabouts of her brother, Robert Howard Noblett. Howard also goes by the name "Zane Grey." He has been missing since 1944. The last letter received from Mr. Noblett was postmarked Prineville, Oregon. He has served in the U.S. Army as a mechanic and may presently be employed along this line of work. He has recently inherited money from his grandfather's estate and if he does not reply, Miss Noblett has no other choice but to claim him legally dead. If anyone knows this man, please contact the Chamber of Commerce. Filling the gap between mental hospitals and society is the purpose of the Central Oregon Chapter of the Mental Health Association. A reorganization is on in the chapter to educate the public of the aim of the organization. Letters will be sent to all businesses and local homes to promote a membership drive in the organization. The group plans to begin a phone service for depressed persons and possible suicidal cases to discourage this line of thought. Enes Smith has gone from flesh and blood criminals to paper criminals. Smith was a policeman for almost 20 years and the lieutenant of the Prineville City Police Department until he retired Nov. 30 to pursue a full-time career as a writer. 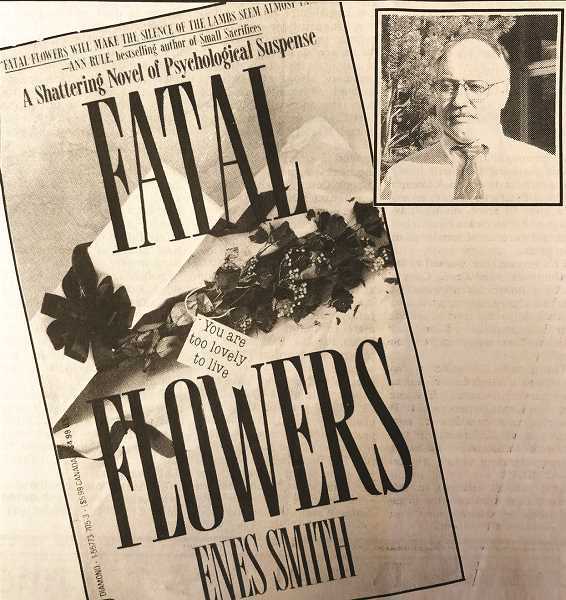 Smith has already published one book, "Fatal Flowers," and has written a second book which will be released next November. Authorities still have made no arrests in connection with the poaching of a large bull elk near Lone Pine in the Grizzly Unit two weeks ago but are continuing to gather information from leads and have generated a list of possible suspects. A reward of $2,000 is being offered for information that leads to an arrest and conviction.